Nope, not Santa Claus. I’m talking about the “Mensch on a Bench” – a dead-eyed plush doll intended to bring Hanukkah cheer to all the good little boys and girls whose parents were totally comfortable co-opting the creepy voyeurism of “Elf on a Shelf” but if and only if the damn thing was Jewish, first. Well, now it seems that the Mensch on a Bench has hit the big leagues – Hollywood – with news that the film and television rights for Moshe, the eponymous mensch, had been acquired by Pilgrim Studios. Why? To develop the character for (shudder) an animated special, just in time for the holidays. Pilgrim says it plans to create an animated Mensch On A Bench holiday special that celebrates the season in a fresh, funny, inclusive way and demonstrates how many of Hanukkah’s themes are universal. I can’t help but wonder which of Hanukkah’s themes they’re referring to? The brutal and bloody civil war between Jewish factions? The subsequent establishment of a theocratic monarchy? Sounds “fresh, funny” and “inclusive” to me! At its core, my gripe with Mensch on a Bench is that it’s the emblematic of the “Us too! Please, dear god, us too!” hysteria that burns through Jews each December. As such, it’s the embodiment of a stubborn refusal to create something new and worthwhile, and instead falls back on copying – down to the very rhyme scheme! – an existing Christmas tradition (if you call something created in 2005 a “tradition”). 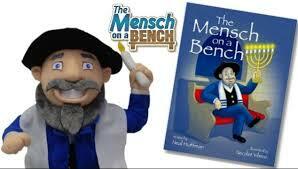 Look, a kid wants a Mensch on a Bench for Hanukkah? Fine, feh, let him have it. Who am I to begrudge a pisher their toy. But, a universally themed Hanukkah movie? Please, 8 Crazy Nights was bad enough already.